Discovery Notes The phage was collected on August 27th, 2014 at 2:37 pm. The environment had moist soil with some foliage around the area. There was not much sunlight and it was near a small stream with polluted water. Not much human activity, occasional human contact since tree is a foot path nearby. The temperature was 22°C and mostly sunny. Naming Notes Once the EM photos came out for this phage, the first thought that came to me was, "Wow my phages look really small and cute!" Then, once the camera zoomed in on the phages a bit more, the second thought that came to mind was that the phages looked like chicken legs. From then on the phage was forever connected to the image of a chicken leg in my head, so I thought it was fitting to name with the word chicken in it. Therefore, the name chicken phender was formed and given to my phage. Plaque Notes The plaques are very small in size, when matured they have a diameter of about 0.4 mm or less. 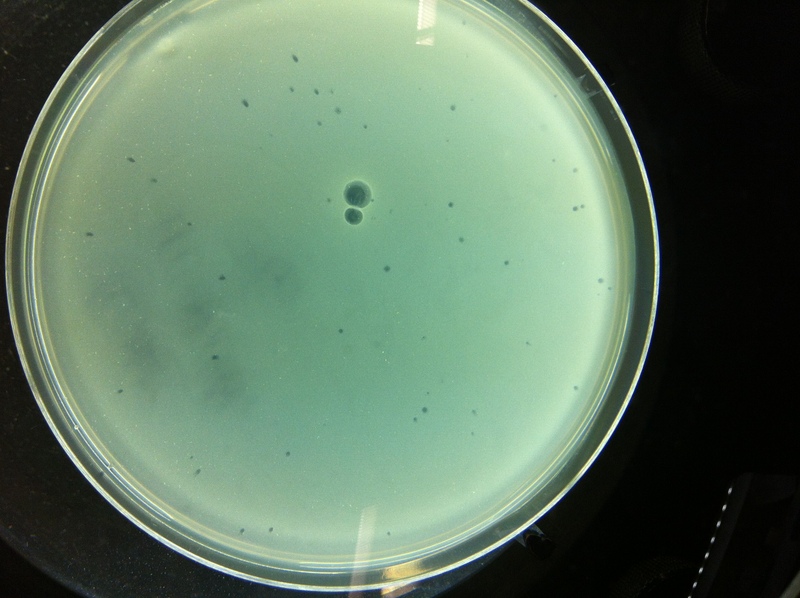 The center of the plaques are very clear, the phages are most likely lysogenic phages, with no cloudiness.